Thank you, thank you, thank you! I just closed on my THIRD investment house. I found all three on AmericanForeclosures.com and they were all significantly under-market- value! Two are rented for a positive cash flow. I’m planning to move into my most recent purchase. It’s in great condition and was on the market a year ago for much more. I bought my house 5 years ago for $89,000 when the asking price was $139,000. It’s worth $300,000 now. I found it on AmericanForeclosures.com. I’m your member forever! I really love the site. It’s easy to navigate and loaded with listings. My husband and I started the membership so we could help our newly married daughter find a home close to us here in Ohio. In a twist of circumstances, my son-in-law’s job changed and he was transferred to California. Not only did we find a great deal on a house for them in the Silicon Valley area but we’re in negotiations on a REO for ourselves nearby! We never expected to move to California but we’re retired and we’re warming up to the idea of life in a new climate. We’ll let you know how it works out. Thank you AmericanForeclosures.com! As a real estate professional, it’s my job to keep up with the latest information and trends. I actually work on the border of two states, so my clients are often located in one state but want to move to the other. 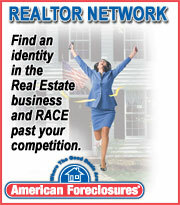 AmericanForeclosures.com is the first database I check when I want to search available properties for my clients. It’s quick and easy, and I like being able to view groups of properties at a glance. It helps me make efficient comparisons and it’s a lot faster than combing through the various MLS sites. Thanks! I had been following this one house for a while and I watched the asking price go down twice. I was a little nervous about making an offer until I was sure it was at the lowest possible price. Well, my offer was $15,000 lower than the bank’s asking price and guess what? ACCEPTED! I’m so excited. This is my first house and I’m absolutely certain I got a great deal. I couldn’t have done it without you. Thanks.